Two spacewalking astronauts may have fixed an ammonia leak outside the International Space Station today (May 11), perhaps bringing the outpost's vital cooling system back up to full strength. Clad in bulky spacesuits, NASA astronauts Chris Cassidy and Tom Marshburn replaced a pump control box thought to be responsible for the leak of ammonia, which cools down the orbiting lab's systems. It looks like this fix did the trick, as no ammonia flakes were seen streaming into space when Mission Control turned on the newly installed gear. NASA officials stopped short of declaring total victory, however, saying that time will tell if the fix holds. "It will take some diagnostics, still, over the course of the next several days by the thermal systems specialists to fully determine that we have solved the problem of the ammonia leak," NASA spokesperson Rob Navias said during live mission commentary. "But so far, so good." Cassidy and Marshburn floated outside the space station at 8:44 a.m. EDT (1244 GMT) today, beginning what officials described as a six-hour detective's investigation to find — and hopefully fix — the ammonia leak. Cassidy, who led the spacewalk, reported seeing "no smoking gun" as he and Marshburn began their inspection of the old ammonia pump control box, one of several on the space station's far left segment, known as the Port 6 truss. It is part of the cooling system for the two wing-like solar arrays extending from the Port 6 segment. Upon removing the box, the spacewalkers still saw no signs of ammonia flakes. "It looks really, really clean, surprisingly so," Cassidy said while peering deep inside the box using what looked like a dentist's mirror. Still, he and Marshburn proceeded to swap out the box, fitting a spare in its place. The ammonia leak was first spotted by space station astronauts on Thursday (May 9), when the crew reported seeing flakes of frozen coolant floating outside. They recorded video of the ammonia leak and sent it down to Mission Control for analysis. While the leak posed no danger to the space station's crew, it could have impacted the amount of power available for daily operations on the orbiting laboratory if left unchecked, NASA officials said. So Cassidy and Marshburn were sent out on an emergency spacewalk to attempt a fix. The roughly 48-hour turnaround made this the fastest spacewalk plan of its kind ever devised for a space station crew, mission managers have said. By around 1:00 p.m. EDT (1700 GMT), a little more than four hours into the spacewalk, Cassidy and Marshburn started heading back to a space station airlock, where they cleaned their spacesuits to make sure they didn't bring any toxic ammonia into the orbiting lab. By 2:14 p.m. EDT, re-pressurization of the airlock was complete, officially ending the spacewalk, which lasted a total 5 1/2 hours. This is not the first time astronauts have had to tackle ammonia leaks in the space station's cooling system during a spacewalk. 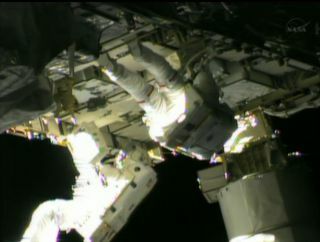 Last year, astronauts Sunita Williams of NASA and Akihiko Hoshide of Japan performed a spacewalk to fix a leak that was also found on the Port 6 truss. That ammonia leak was in the same coolant loop as the current leak, but engineers do not yet know if the two leaks are related. The station's Port 6 truss is the oldest piece of the space station's scaffolding-like backbone and carries two of the outpost's eight wing-like solar arrays. It launched in November 2000 and was originally installed on the station's roof, towering over the orbiting lap. In 2007, visiting shuttle astronauts relocated the P6 truss to its final location on the station's far left side. This was the fourth spacewalk for both Marshburn and Cassidy, and the 168th total to support space station assembly and maintenance. Inside the International Space Station, commander Chris Hadfield of Canada and Russian cosmonauts Roman Romanenko, Alexander Misurkin and Pavel Vinogradov followed the spacewalkers' progress. Today's spacewalk comes just two days before Hadfield, Marshburn and Romanenko are due to return to Earth to end their five-month mission in space. The three men are due to leave the space station on Monday (May 13) and land on the steppes of Kazakhstan in Central Asia. Those plans are still going forward, space station mission managers said.